Having been in the shooting and training business as well shooting IPSC and IDPA for the last ten years I have been fortunate enough to shoot or own a number of firearms from many noted pistol plumbers. My stable of 1911s include work from Novak’s, Wilson Combat, Springfield Custom Shop, and Gunsite’s Gunsmithy. I have had the pleasure to shoot custom blasters from Heinie, John Yanek, Les Baer, Cylinder & Slide, and Action Works for extended sessions and many others for the dreaded chrono at IPSC matches. 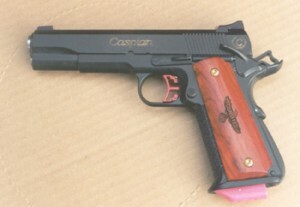 Yes, the custom 1911’s I have were built for me, but its tough to get exactly what you want. Every shop has preferences for parts so instead of waiting or paying more I took what was available. If I was willing to wait or fork over more cash, I could have had everything my way, but lets face it–certain things from the factory are good so why replace it. The more I thought about it, the more I realized I really wanted a 1911 built my way for me. Instead of waiting upwards of a year and paying in excess of two grand, why not build it myself? Since the Army spent vast sums of money sending me to the Special Forces Q Course for light weapons and having been raised on the 1911, I felt I had the knowledge; besides I have a Dremel tool. So the task at hand was to determine what I actually wanted in a 1911. Lets see, a good ambi safety, a posi-grip; grip safety, tough parts that take abuse; the slide stop, the firing pin stop, the firing pin, tactical mag release and hex head locking screw, excellent tritium sights, an excellent barrel for those sub-MOA shots at two feet, and for those blazing sub-2 second splits; a good trigger, quality internal parts, and lastly a solid steel frame and slide with a matte black finish. So who makes all these parts, in order: Chip McCormick, Wilson Combat, AFTEC, Ed Brown, Heinie, Nowlin Mfg, SVI, EGW, Caspian, and Brownells. Coincedently all the parts are available from Brownell’s. After a few calls and mailing ffls to round up the parts, it was time to wait for everything to arrive. Over a few weeks all the parts showed up, save for the major one, the frame and slide; really helps to hold the other parts. A quick call to Caspian had them on the way, filing error. In two days time everything was here all at once, now what? After a quick study, fitting frame to slide seemed like a good place to start. This was accomplished fairly quickly with a few good metal files found at a local hardware store, and some fine and medium grit emery cloth for final sanding. The slide to frame fitting took about two hours and I did not want to over cut the rails and have paper weights; if not for the excellent work from Caspian it could have taken longer. After that off to the races. Before putting all the other parts together, all sharp edges had to be removed from the slide, frame and small parts. Trust me a sharp edge on a thumb safety, or slide stop can make for a long week at Gunsite. Short work was made of this with the handy Dremel and an assortment of grinding and polishing wheels. From there on out it was like putting a model together. All parts fit as advertised, especially the easy fit barrel from Nowlins. All it required was a little polishing of the rear of the hood and polishing the feed ramp of the frame. The SVI Tri-Glide trigger parts(trigger, leaf spring and disconnector) dropped in. All of EGWs pins mated up like they should and the ejector had plenty of material to allow for fitting/tuning to personal choice. 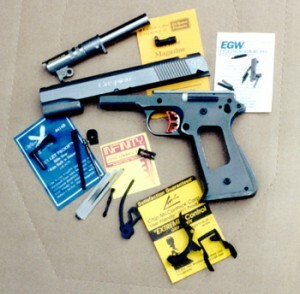 As in many cases the Ed Brown magazine release needed minor fitting, as did the Heinie Straight 8 Slant Pro sights. Wilsons “Bullet Proof” slide stop needed a little polishing to allow for smooth interface with link, but the firing pin stop and extractor dropped right in. The Wilson BP extractor would have been great but this is a racy 1911, so I wanted one of those nifty AFTEC extractors. All the top shooters say they are the only way to fly. So why discuss just the extractor, because care needs to be taken when putting it together and in. The AFTEC is 4 parts; 2 springs (for constant tension), a cap, and the extractor. After reading the enclosed instructions, if you are uncertain how to get this beast in, call AFTEC, it can make life easier. At last it was time to finish the 1911. Since I didn’t want to wait to ship it to and from for finishing, Brownells latest finish in a can–GunKote was the answer. This is an oven cured, teflon/moly baking laquer-(molybdenum disulfide). It goes on easily and evenly and provides a durable self-lubricating finish done at home. WARNING, before doing this check with significant other as it has an odor; and neither Brownells or I will be responsible for your losing your happy home for failure to follow this warning. About two hours after application and baking, what emerged from my oven was a black 1911 and it looked cool. 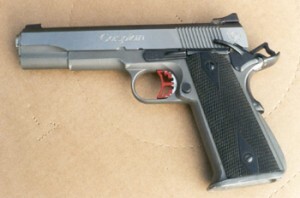 So how does this 1911 of many parts and manufacturers shoot, excellent. It was tough the first time out to the range; some more polishing of the feed ramp and light polishing of the rails was required. After that this 1911 has been a tack driver and runs smoothly. In the accuracy department thanks to the Heinie sights and Nowlin barrel, it can’t be beat. As seen in the photo, that is an eight round group at twenty yards offhand, less than 1 3/4″. If better accuracy is required to play IPSC or IDPA I haven’t seen it. To build your own 1911 start with Brownells they can be your one stop source for all the parts you need. 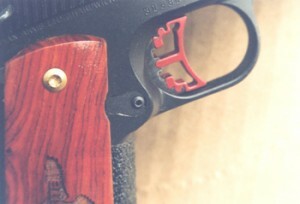 Check out the web pages for the folks at www.brownells.com, www.nowlin.com, www.sviguns.com, www.heinie.com, www.chipmccormickcorp.com, www.wilsoncombat.com, www.edbrown.com, and AFTEC at770-506-0849, and Caspian at 802- 472-6454. You can have it your way with time and patience.